Should you go with 144Hz (165Hz) TN or IPS in terms of pixel responsiveness? Is 240Hz even worth it? And why we're not talking about a VA panel? First: I dont own a VA panel atm, second, a VA panel is worse than IPS and TN in terms of the response time. In addition, a VA panel also has smearing (a slow Grey-to-Black response time) which means, that you have more motion blur, especially in dark image content, darker areas and dark objects. how much motion blur do I perceive? 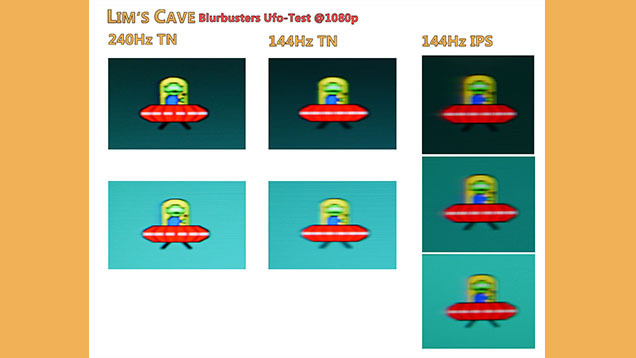 The difference in motion blur between 144Hz between an IPS and a TN panel is more apparent in certain tests, such as the ufo test, compared to simple gameplay footage. 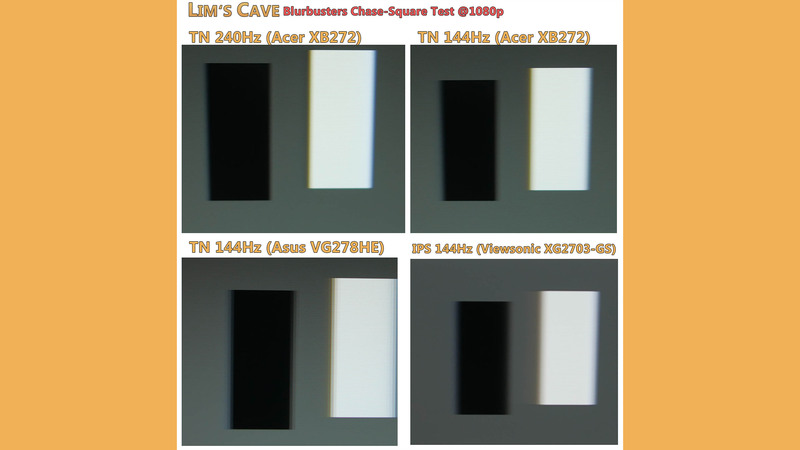 In terms of pixel response time, the human eye can see a difference between TN 144Hz, IPS 144Hz, and TN 240Hz. The 144Hz TN version is a bit faster and has less motion blur than the 144Hz IPS, whereas the 240Hz TN version is even better than the 144Hz TN version with even less motion blur. Ufo-Test for the Acer XB272 at 240Hz (left), the Acer XB272 at 144Hz (middle), and the Viewsonic XG2703-GS (right). The difference is pretty slight, in person, however, the step from 144Hz TN to 240Hz TN is bigger compared to 144Hz IPS to 144Hz TN on these tested units. Strangely, the Acer XB272 on 144Hz is nearly the same an on the IPS panel with 144Hz and this monitor gets a very good boost when reaching 240fps on 240Hz. So I've taken another Full HD 144Hz TN monitor to compare the XB272 with maximal 144Hz. The result is nearly the same. My old Asus VG278HE is only a tiny bit faster than the Acer XB272 when setting both to 144Hz. Another nice info is that the difference in motion blur on a WQHD TN unit with 144 Hz compared to a WQHD IPS unit witch 144Hz is a bit more visible than on a Full HD TN vs a WQHD IPS model (even when setting the IPS model to Full HD). Since I cannot keep all units I review, its really hard to tell in general if all Full HD 144Hz monitors are nearly the same as all WQHD IPS model which are used for this test. When comparing the chase-square test from Blurbusters you will be able to see that the IPS panel has a little bit more trails at a black and white square on a dark grey background. Chase Square Test for the Acer XB272 at 240Hz (top left), the Acer XB272 at 144Hz (top right), the Asus VG278HE (bottom left) and the Viewsonic XG2703-GS (bottom right). When taking some game screenshots and moving them around while comparing both (TN and IPS @144Hz) it is really extremely hard to tell a difference. Again: At 240Hz it is easier to see a difference in terms of motion blur and clarity. But just because you have more Hertz doesn’t mean your monitor will have less motion blur even when reaching 240Hz. For example, when you’re moving very slowly or very quickly in a game, you won’t be able to tell the difference on what Hz your monitor is. Only when you get to that “sweet spot range” will you see the IPS panel showing motion blur and the TN panel not. So, how much of a difference is there between an IPS and a TN panel? Well, the difference between a 144Hz TN and a 240Hz TN is bigger than 144Hz IPS vs a 144Hz TN (at least on these specific units I've tested). 240Hz is really an upgrade if you play games where you can reach 240fps with your graphics card and you DON'T want to use ULMB or equal backlight scanning, backlight strobing or motion blur reduction solutions like BenQs DyAc, LGs motion 240 or Asus ALMB due to those usually limiting your refresh rate to 120Hz. This does not mean necessarily that the lowest possible input lag on a 60Hz display is 16.667 ms. The same rule applies to a 240Hz monitor while on a 240Hz display this means that each 4,166 ms (or 240 times a second) a new picture will refresh whereas on a 144Hz display each 6,94 ms a picture will refresh. So, in theory, you have a fewer input-lag between pressing the mouse button to send the signal to the display. However, the number of Hertz is not the only rule regarding the input lag because of your network connection and combined with it the data packet and other components like your peripherals, your pc hardware and even the display itself must send a signal to the panel, so that we cannot guarantee that a 240Hz display will always have a fewer input lag than a 144Hz display. In this picture, I’ve created an example to show you the difference between 10 and 20 fps. As you can see, 20 fps will increase already the smoothness compared to 10 fps and the human reaction also will be able to react faster and spot an enemy sooner. Imagine this picture with 60, 144, or even 240 frame refreshes, the difference in spotting an enemy sooner will decrease the more Hz you monitor has and the more fps you reach. However, above 144Hz this is negligible. 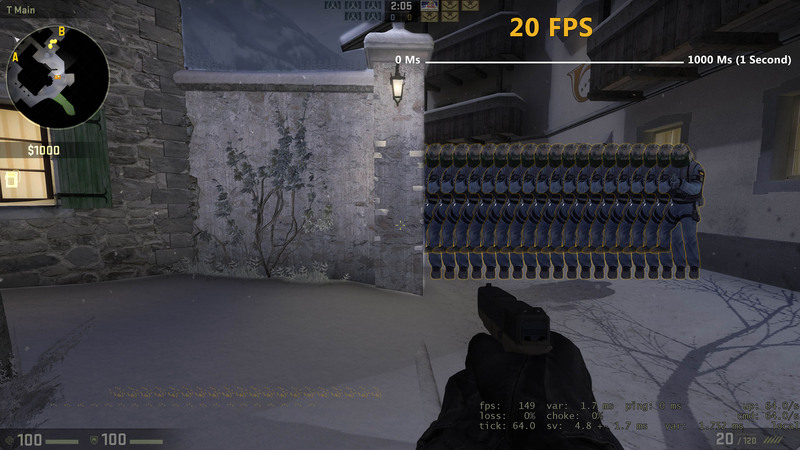 How often an enemy is refreshed within 1 second at 10 fps in CS GO. How often an enemy is refreshed within 1 second at 20 fps in CS GO. 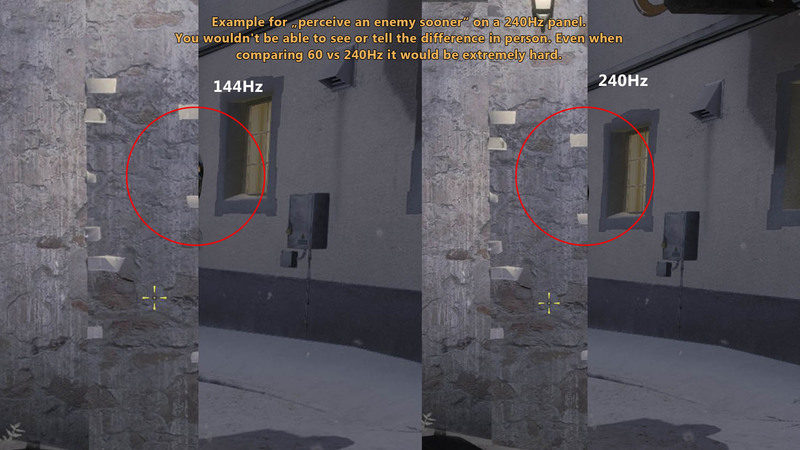 An example of how your monitor will display an enemy sooner on a 240Hz monitor compared to a 144Hz monitor. At last 240Hz will also increase the smoothness of your gameplay experience a bit, even it is here again pretty hard to tell a difference, while stutterings between 60 and 144 Hz already are pretty good eliminated. When playing online, you also should keep in mind that the ping (the latency or the delay to the server) also is important for the input lag. In the end, the ping will be added to your input lag into your "total" input lag. You only should consider a 240Hz panel when you are able to reach 240 fps in the game you play. CS:GO and Overwatch are probably the most popular games where a 240Hz panel makes sense. For some indie games like titan souls, firewatch, hyper light drifter and so on, I would prefer a WQHD 144Hz panel, definitely. If you aim to reach 240Hz in PUBG for example, you probably have to wait for newer graphics card series, but if these games are your main games where you spend the most time on your PC, a 240Hz panel is definitely worth it. So in the end, 240Hz is not a gimmick, especially in terms of motion blur. For competitive games, these gaming monitors are currently the best you can get on the market. I would recommend a 240Hz monitor for everyone who mainly plays competitive first-person shooter - but, if you also like to play some other games like Witcher, Dark Souls, and many other games I would say: Go with a WQHD (TN or IPS) monitor. Will a 240Hz gaming monitor improve your skill? My answer is definately no. What about the difference between TN and IPS at the same refresh rate (144 or 165Hz for example)?. There is a difference, yes, and strangely I was able to tell the difference easier when comparing 1440p TN vs 1440p IPS compared to 1440p IPS (setting to Full HD) vs 1080p TN. In my opinion, you shouldn't worry about IPS response time since the difference, especially in games, is not huge and sometimes even really hard to tell and in the end, you will reach more skill within a game with a TN panel, but you get an overall better picture quality with IPS. I'm sure, that most of the people will share my opinion, but if you're someone who wants the currently best possible pixel responsiveness within a WQHD high refresh rate monitor and you can deal with worse colors, viewing angles, and blacks(contrast) then you also can take a closer look into current TN models. - Why 6500K, 120cd/m2 and Gamma 2.2 is standard and most recommended? - How to calibrate my monitor? - Timeline Coating (Coating Database) "Guideline panel coating surface"
- 1 MS TN vs 4 MS VA: The difference?! Support Lim's Cave with a subscription on YouTube. Follow on Twitter and Facebook for news and info about upcoming reviews, monitor releases, and other interesting posts.